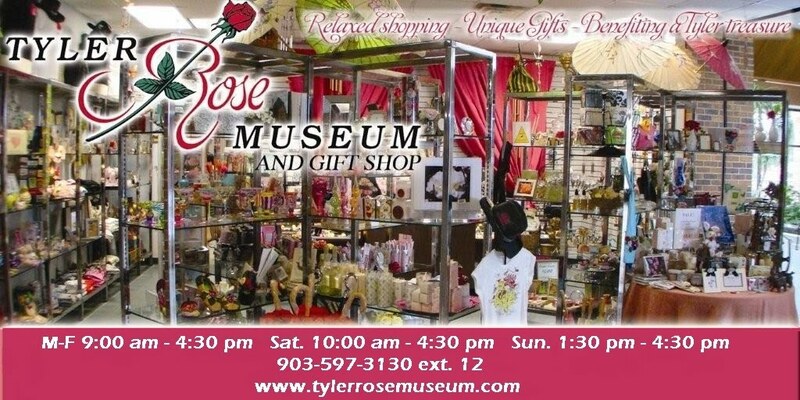 The Tyler Rose Museum Gift Shop has a splendid variety of unique and "rosy" gift items, reflecting Tyler's proud status as "Rose Capital" of the Nation. Shoppers from near and far will find a wide range of gifts and mementos perfect for all ages. Many visitors to the Tyler area come to the Rose Museum Gift Shop for Texas and Tyler souvenirs. Everything from mugs to magnets... trivets to t-shirts... caps to candles... pens to postcards... and a whole lot more... offering visitors a great selection of Texas and Tyler treasures to select from. Texas Rose Festival annual commemorative souvenirs are also available in the Gift Shop. An extensive selection of unique t-shirts can be found at the Tyler Rose Museum Gift Shop. Texas shirts promoting our Lone Star State are always popular... as well as Tyler t-shirts, for those tourists who want to remember their stay in the City of Roses... not to mention those who have children, grandchildren, or friends named "Tyler"... who will be especially delighted with a "Tyler" t-shirt. Shirts with gardening motifs, florals of all kinds and roses, of course, are prominently featured in the gift shop.